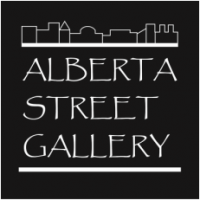 Check out our galleries and discover the plethora of art in nearly every business on Alberta Street. From restaurants and bars to dress shops and wellness studios, you will find a rotating roster of artists represented on their walls. “Log Dam,” by the team of Nick Byers, Collin Janke, and Dan Petrescu (all from Hennebery Eddy Architects), which is sited in front of the Tin Shed (1438 NE Alberta Street). Forest for the Trees is a not-for-profit public mural project in Portland, Oregon. The mural project promotes public visual expression; collaboration; and community engagement with contemporary art and the creative process. Artists: Blaine Fontana, Zach Yarrington & Jun Inoue. This sculpture gazes eastward from its perch on 18th & Alberta, facing the rising sun, looking for a new day when humans and nature harmonize. Its pose is dignified and vaguely humanized, standing on its stump at just over six feet tall. 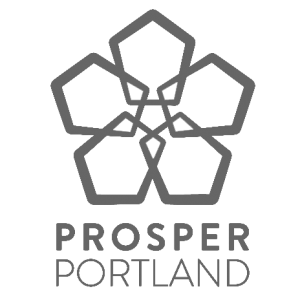 This artwork was selected by a local panel of artists and citizens, and will become part of the City of Portland’s Public Art Collection, administered by the Regional Arts & Culture Council.